The What: RDL has released 2 new voltage controlled attenuators, designed for stereo audio or surround sound system attenuation. The What Else: The RU-VCA2A and RU-VCA6A are full-featured studio-quality dual-channel audio attenuator modules for local and/or remote control of balanced or unbalanced line-level sources. 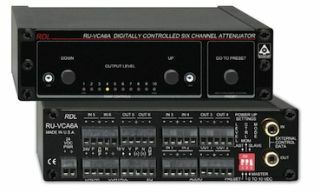 The RU-VCA6A has all the features of an RU-VCA2A with four additional audio channels for level control of surround sound (5.1) or six individual analog audio channels. For control of a 7.1 surround sound system, an RU-VCA2A and RU-VCA6A may be used in conjunction, with one being set to master mode and the other to slave mode. The Why: Wide-band low-noise performance makes the RU-VCA2A and RU-VCA6A suited to level adjustment in demanding applications. One More Thing: Each module can be remote controlled from a single or multiple locations. Rear-panel terminals provide flexible control options using a variety of RDL remote controls including the popular RLC10K 0 to 10 k Ω remote control or other OEM equipment. Audio levels are controlled in 0.5 dB steps using noiseless zero-crossing digital attenuators for optimum reliability, precise tracking and long-term click-free service.